If you have been looking for a guide that will take you through the features of a modern, industrial interior design look and how you can adopt this trending design for your own home, you have come to the right place. The modern industrial interior design is a look that has grown massively in popularity over the last twenty years and is now seen in loft apartments and newly built homes across the world. Initially, popular more than 40 years ago as people looked to convert industrial buildings into homes, the modern industrial interior design look is fast becoming the design style of choice for many people in recent years. Born out of celebrating the exposed raw elements of a property such as brickwork and roof structures, modern, industrial interior design offers up a character that cannot be matched by any other style of interior design. 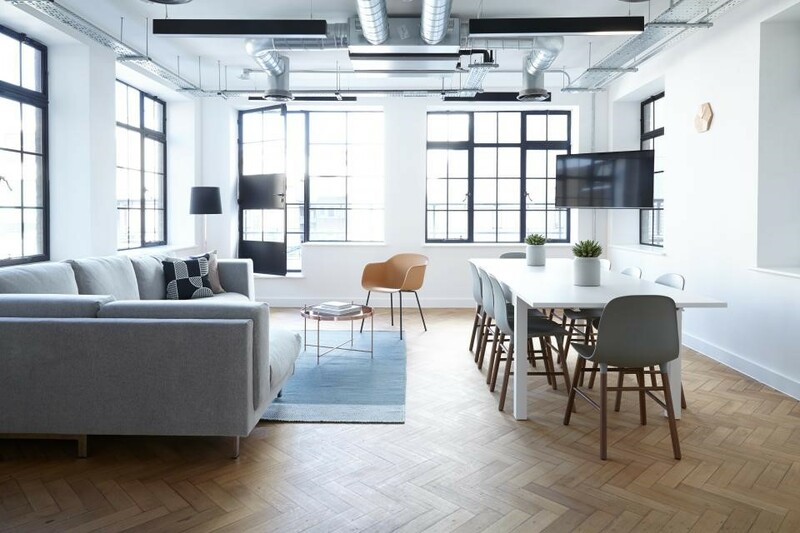 Industrial interior design and modern, industrial interior design are often wrongly construed as being synonymous with each other, yet while they do share common traits, there are actually a number of slight differences between the two. In this guide, we will take you through the two design styles and hopefully arm you with the information to choose which of them would suit your tastes and your property better. We will distinguish the differences between both of the styles, explain each of their core design features and what you would need to think about if you wanted to implement either style. Read on to understand the core differences and to learn how you can incorporate either style into your own property. Industrial interior design first became popular back in the 1970’s when warehouses and factories were closed down. Many of them were converted into living spaces and instead of trying to hide what initially seemed like the ugly and unwanted features of the property, decided to just go with them. Where other design styles try to hide the materials used in the construction of the building, industrial interior design embraces them and even uses them as the main features. Whether it’s the unfinished brickwork or exposed beams, pipes and ducts on the walls and ceilings, industrial interior design often gives an unfinished look or something that many of you would describe as being a warehouse look. Exposed brickwork immediately adds character and charm to a living space and works especially well as an accent wall. Exposed metal pipework and beams also bring a timeless charm to a room and should always be embraced. Designed to offer style that has been done in a practical way, industrial design displays a wonderful balance of form and function. Metals, woods, glass and a neutral earthy colour scheme are commonly used in properties that adopt this style. Metal framing around windows, metal light fittings and metal handrails are often combined with painted brickwork and wood finishes to achieve the industrial look. One of the key elements of the industrial interior design look is that it should encompass a good mix of old and new. This could be a vintage couch as a centrepiece coupled with a modern looking glass staircase using glass clamps and handrails. Alternatively, you could blend modern furniture with vintage accessories and rugs as another way to find the right balance. There are many different variations of industrial interior design which can be achieved through the different colour schemes, decor and furnishings, so we thought we would show you a few different designs. A common example of a traditional industrial interior design can be seen below, this one making more use of wood and earthy colours. Here you see the vintage style furniture that is coupled with wood flooring, exposed beams and an open plan. This one shows the blend of old and new that we touched upon. 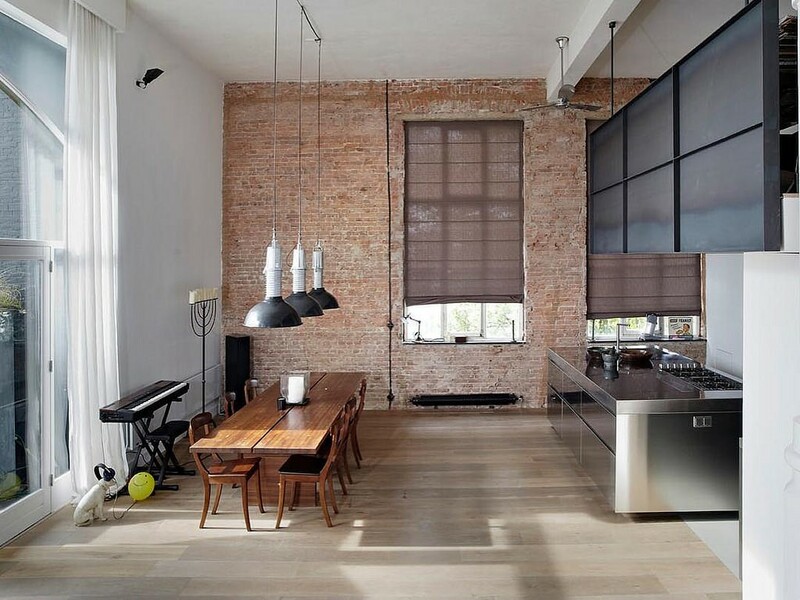 Unfinished and exposed brickwork and a wooden table are complemented with modern stainless steel. 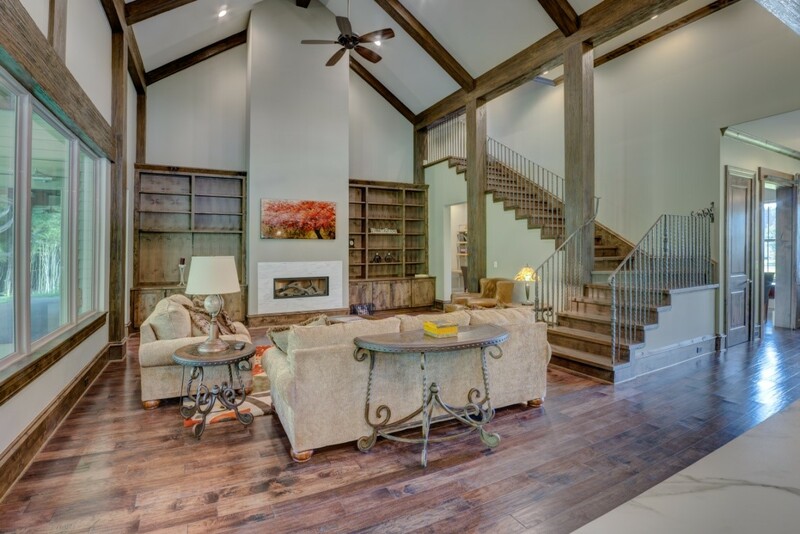 If you’re sold on the rustic beauty that industrial interior design can provide, you will probably want to know how you can go about achieving it in your home. Achieving industrial interior design can be done in many ways but essentially, this raw, tough and often minimalistic look is accomplished via the following ways. Walls: One of the core features of the industrial design is to celebrate any exposed brickwork, beams, pipework and ducts. Leave everything as it is or simply paint over any brickwork if you feel that it would enhance the look. Lighting: Metal light fittings with exposed bulbs are the way to go here but don’t use anything that is too You want to create a warm environment here, which can be done with softer lighting. Flooring: Traditional industrial interior design would not be achieved without a wood-finished floor. The only other alternative would be to use polished concrete instead as that also adds to the unfinished vibe that you are after. Colours: Neutral colours such as greys, browns and even blacks work well in this design style. The idea is that metal finishes such as vertical handrail brackets, handrails and metal-framed windows will become more prominent due to the colour scheme. Essentially, half the job is already done if you have any exposed brick walls and wooden or concrete flooring. All you would have to think about then would be the furniture and achieving the right balance of new and old. Furniture that you use to decorate your living space should be used in a fairly minimalistic manner and serve a purpose. The industrial interior design calls for furniture that is vintage or salvaged as it adds to the rustic style that you are trying to create. Industrial shelving, classic leather sofas, and aluminium chairs work great for this style. Unfinished woods should be used for tables or you could go down the route of using reinforced concrete topped tables which look great too. Charity shops can be a great place to pick up aged furniture on the cheap, so you do not even have to spend too much in reality. You might also find some faded rugs that would not look out of place for the style that you are trying to achieve. Stainless steel countertops are also commonly used in industrial interior designs as well as many including steel on doors and windows. Salvaged ornaments are also highly desired to finish this look. Old salvaged clocks or vintage posters can work great as decoration pieces and will really add to the unfinished warehouse look. If you’re looking for some good industrial staircase ideas that would fit the interior design that you are planning to implement, we have a couple here for you to peruse. They are both different styles from each other with the first offering up that rustic look and the other providing a more functional and minimalistic look. Spiral staircases often looked great when coupled with industrial interior design. As you can see below, minimalistic and serves a purpose – exactly what this design demands. Here we have another beautiful industrial staircase. This one uses a wonderful blend of wood and glass to create its industrial interior look. What is a Modern, Industrial Interior Design? Where modern industrial interior design differs from its more traditional cousin, is that is that it’s more minimalistic with regards to the decor, concentrates on function before form, uses clean lines and no longer relies on a blend of old and new. Essentially, think of industrial interior design without the vintage furniture, with bolder accents in the colour scheme and more focus on art. Simplicity is the order of the day with the modern industrial interior design. Architecture is still embraced and kept in full view but the design offers a more streamlined and functional aspect. As one of the fastest growing design trends, the modern industrial interior design is ideal for large open plan rooms but it can still work in smaller spaces too. It’s all about making the best use of the space that you have and making sure that furnishings and fittings are there for a purpose rather than for show. Containing a neutral colour scheme, designers often prefer larger windows and furnishings that have a sleek look using materials such as metal, glass and chrome. Art is commonly used on the walls and a very minimalistic approach results in an open plan look that makes smaller rooms look a lot larger. Again, there are different takes that can be implemented into a modern, industrial design as long as the core features are there. We have a few different designs for you to look at which we are sure that you will appreciate. The kitchen space design below displays the clean lines, natural light and functional furniture that are among the important features of the modern industrial look. Glass and metal have also been used in a perfect balance to create a sleek and minimalistic feel. Here we see the prominent pipework, natural light and sleek lines that are required to pull off a modern, industrial design look. Wouldn’t you just love to create something similar? Now that you know more about modern industrial interior design and its core features, you would probably like to know more about how you could achieve the look in your home. First and foremost you will certainly need to declutter your home as much as possible. Get rid of anything that is not functional and fits in with what this minimalistic style requires. 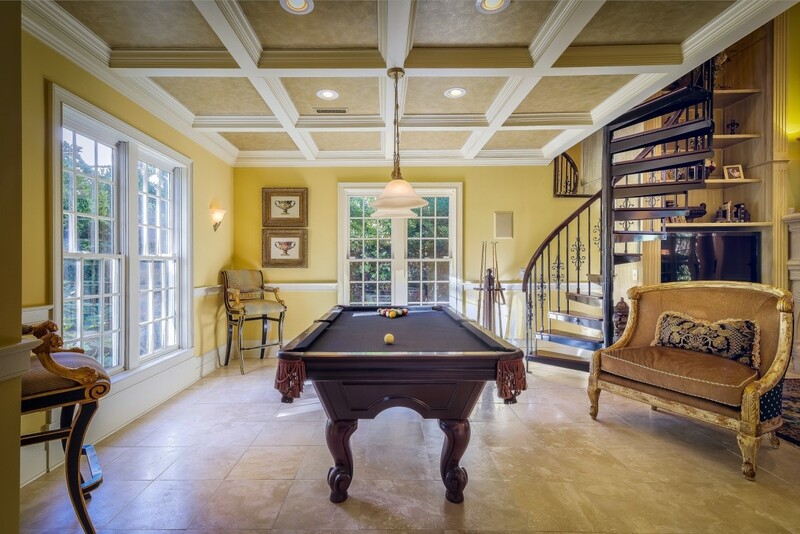 Not too dissimilar to industrial interior design, you will want to make sure that you emphasize the unfinished looking areas of your property. Exposed roof structures, pipework and brickwork will become the cornerstones of your design. What you can do differently is be a bit braver with your colour scheme and decor and be a lot more creative. Set an artistic theme to each room and choose some bolder colours to accentuate any brickwork. Walls: Again, you should be looking to accentuate any exposed brick walls as well as any other of the architecture of the building. Beams and pipeworks will go a long way to pulling off this modern take on the industrial interior design that you are aiming for. Lighting: Natural light is the preference here rather than the dimmed and warm setting that industrial interior designed aims to achieve. The more natural light that you can get into the room, the better for a modern and sleek design style such as this one. Flooring: Wood or concrete flooring is almost demanded if you want to complete your modern industrial interior design. Rugs can also help to make a statement if they match the colour scheme that you are implementing. Colours: Modern industrial interior design does allow designs to be a little bolder with colour choice compared to industrial interiors. Accents, in particular, are often in bold colours and while neutral colours are still the order of the day, you are not restricted to earthy tones. Bring in furnishings such as metal, glass or chrome surfaces and large sofas with metal legs to help define the design that you are trying to create. Glass is also being used more and more in modern industrial designs due to its minimalistic and streamlined look, so you could opt to use glass brackets to create Juliet balconies or stairwells. Only use furniture that is both functional and economical and make sure that any furniture has clean lines and basic shapes. As for light fittings, a modern metal look is desired here too, so hanging fittings with exposed bulbs and chrome lamps will really help to achieve that. Also, do not forget to add plenty of artwork around the room as this also falls in line with the character that you are trying to create. To get a good idea of the different designs you could go for, we suggest having a look around online at other modern industrial designs. There are tons out there and each will have its very own character. They will all differ from one another but that is the beauty of this style of design as it affords plenty of room for creativity. Looking for some ideas for modern industrial staircases? Then why not take a look at a couple we have found. 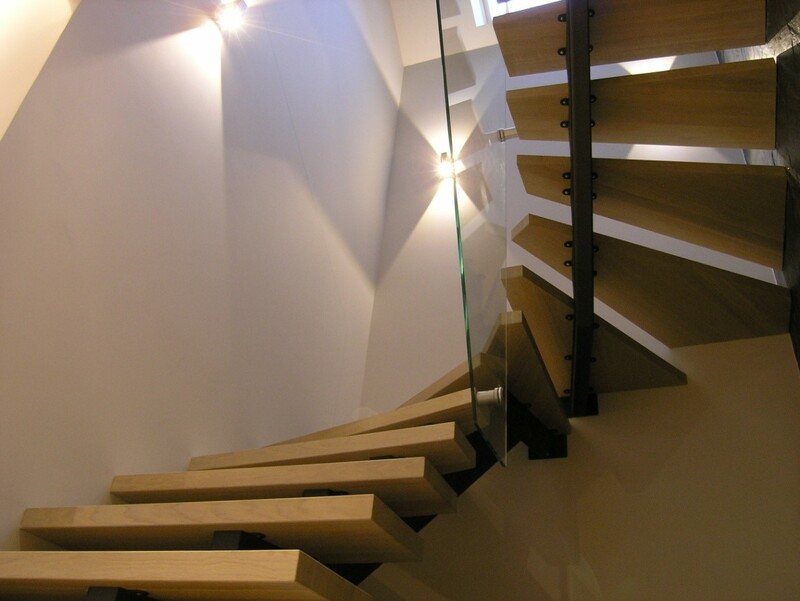 Both are excellent examples of the sort of beauty that you could add to your home with a new staircase. 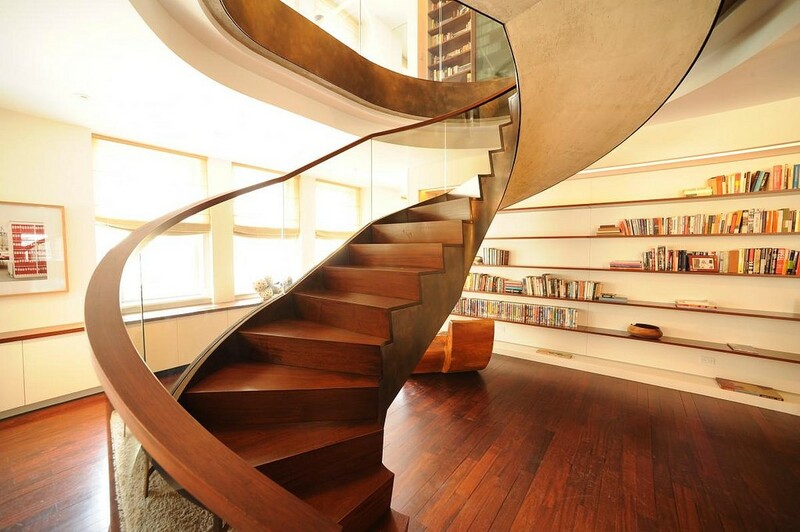 Using wood and glass to wonderful effect, you would have to agree that this staircase looks fantastic. A design such as this would be a centrepiece in any room and it really showcases the function over form that modern industrial interior design demands. 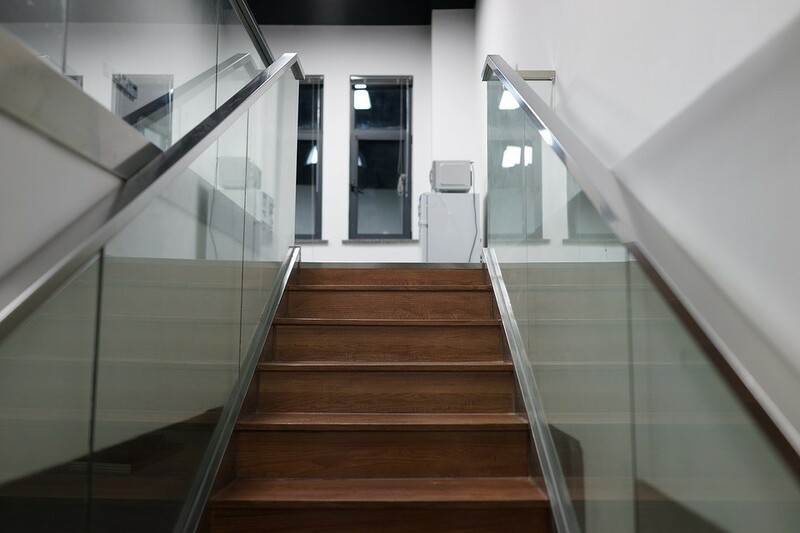 Utilising glass topped with chrome for the hand railings and wooden steps, this design perfectly showcases the sort of look that you could achieve in your home. Hopefully, this guide will have proved valuable to you and sufficiently taught you what you wanted to know about the differences between industrial interior design and modern industrial interior design. As you can see, they share common traits but also have some fairly big differences as well. As the names might suggest, one offers a modern take on the design while the other is something more rustic and vintage. What they share is the embracement of any inner architecture that might be showing on your property and just differ on the decor mainly. Additionally, while it would be ideal if you did have exposed brickwork or some exposed roof structure, you can still implement the many other features of these style designs. There is nothing to stop you going with the sleek, artistic and minimalistic look of modern or with the mix of old and new that makes up the traditional industrial look. Both design styles offer up their own aesthetic beauty and it will come down to your personal preferences when it comes to choosing which one to implement in your home. Your own character should be considered too before making your decision but this will come out in your design anyway as we’re sure you will add your own twists to whichever you go for. 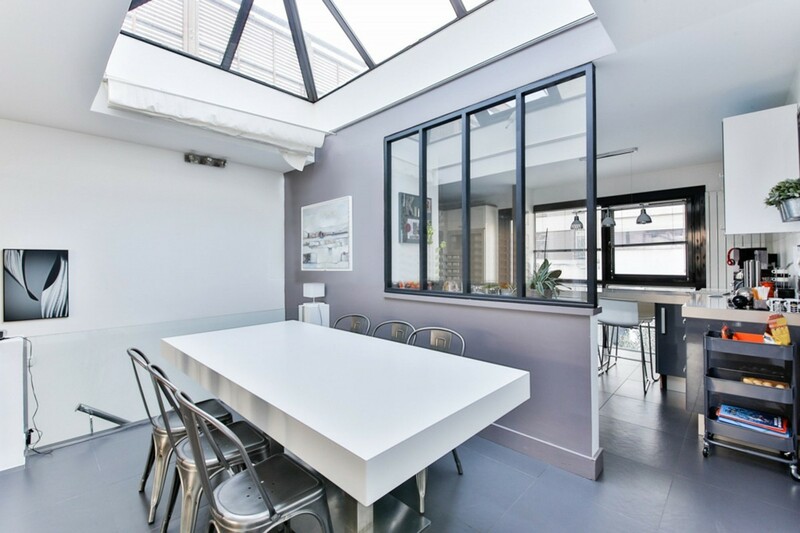 We suggest that you do a bit more research and take a look at pictures of other properties have used either of the industrial interior design models. You will be able to get some good ideas about what you could implement in your own home and will no doubt learn more about what you can away with being without. Once again, thank you for reading and we wish you luck as you go on your quest to install one of these excellent interior design styles into your home.